Best Apartment I Ever Sold invites our agents to share the unique story of their best selling experience to date. This week, learn why Lisa Garey’s sale at 160 West 66th Street, 45A is her best one yet. Real estate agent professionals are frequently called upon to keep their own emotions in check, and guide their sellers and their buyers toward a successful transaction. At no time was that ever more true for me when I represented the sale of my own uncle and aunt’s apartment, 45A at 160 West 66th Street, also known as 3 Lincoln Center. My uncle, a retired film producer, had lived in the building – a striking, gray glass tower, clad in pink limestone on the lower floors to match Lincoln Center – for several years before purchasing 45A in 2004 with his new bride, my aunt Sharon. He loved the building with its wonderful, attentive staff, stellar location and jaw dropping city views from the upper floors. In fact, many memories were made with the fantastic view as a backdrop. 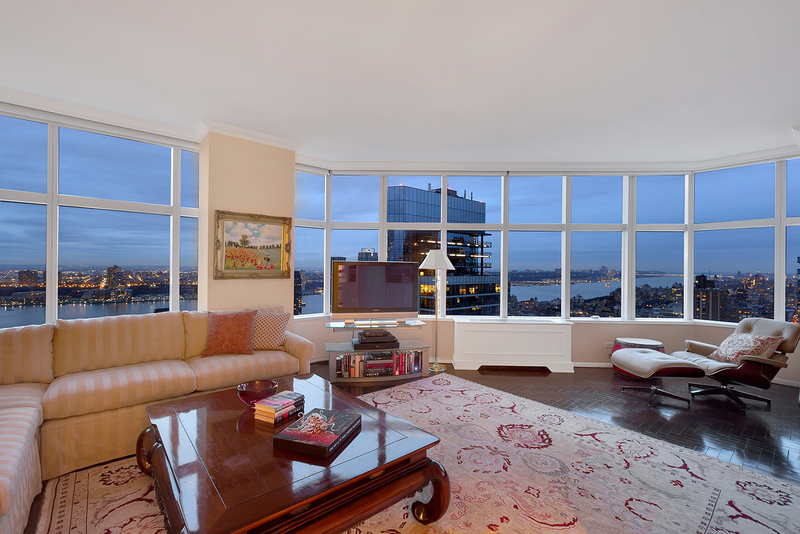 Through floor-to-ceiling, wraparound windows, the Hudson River could be seen winding its way northward to the west, and the shimmering Central Park Reservoir and greenery to the east. At night the magic of the city lights and moonlight were magnified by the water’s reflection. This apartment reminded my uncle, previously a boat-owner, of being on one of his boats. When you sat on the sofa in the living room, the Hudson River was at eye level and the sky above was enormous. In March 2017 my uncle passed away suddenly, and my aunt needed to sell the apartment quickly. The 2-bedroom, 2.5-bathroom apartment had not been renovated in over 13 years. In addition, due to the challenging market at the time in addition to all of the new development in the area, sales in the marvelous building had been sluggish. We priced it carefully and ended up getting not one, but two all cash offers at the asking price for my aunt – in only 63 days on the market. There were other apartments for sale in the building that were listed before my uncle’s death that are still on the market now. It wasn’t easy to put my emotions as a niece aside, but I was so pleased to be able to help my seller – my aunt, in this case – make the transition she required, and to do it quickly and efficiently, as I would with any seller. But this case was special for sure. The consolation was finding a buyer whom we knew would love the apartment as much as my uncle and aunt had loved it.